Jessica Hughes is a lecturer in medical sciences at the University of Wollongong, Australia. Her research focuses on the role of lipids in health and disease. She currently lives with her husband Lucas and their three dogs in Wollongong, where she enjoys walking the dogs on the local off-leash beach every morning. 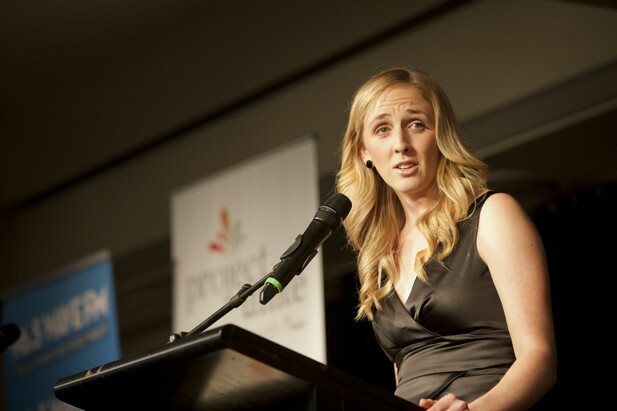 Jessica Hughes, speaking at the Wests Illawarra Youth Achievement Awards, 2012. Most of the tissues in our bodies are extremely sensitive to changes in fat intake in our diet and will incorporate these fats into the membranes of our cells. This can affect how our cells work, as these fats—or lipids—can influence the efficiency of various proteins. The lens of the eye is different: the lens is one tissue where there is NO ability to regenerate or replace membrane fats. This means that if the lens gets damaged over time, that damage is permanent. Damage like this might be part of the reason behind eye conditions like presbyopia or cataract. What attracted you to studying lipidomics in the lens? After completing my undergraduate degree in 2006, I became interested in the unique environment of the human lens and how the components of the lens cell membranes do not appear to be renewed or replaced. From here I undertook several studies in my PhD to examine the extent of membrane lipid turnover. I examined the ability of diet to influence membrane lipid composition in rat lenses. I also investigated the extent to which fatty acids could enter and be incorporated into the lens. Finally, I investigated the impact of ageing on these seemingly long-lived lens lipids in humans. Our recently accepted eLife manuscript was an extension of data I collected during my PhD. We used the spike in atmospheric carbon-14, created by the testing of nuclear weapons between 1955 and 1963, to measure lipid turnover in the human lens. Our data clearly show that there is no turnover in these lipids over our entire lifespan (Hughes et al., 2015). This is the first evidence of its kind to demonstrate the presence of long-lived lipids in the human body. In fact, there is no record to date of any similar occurrences in the natural world. That is pretty exciting to me! I am currently examining the role of lipid signalling molecules in the development of mental illnesses such as schizophrenia and depression. Being able to pass on my knowledge and skills to my previous and current students. When the experiments for this current publication wouldn’t work due to contamination – we spent a very frustrating few years working this out! There are quite a few people; it’s tough to narrow it down! It would have to be some of the experts in my field of study, such as Professor Kevin Schey (Vanderbilt University) and Professor Douglas Borchman (University of Louisville) and definitely my three PhD supervisors – Stephen Blanksby, Roger Truscott and Todd Mitchell. They all have two common qualities; they are passionate about their fields of research but at the end of the day they are also down to earth people who are genuinely interested in helping the younger generations achieve in the scientific arena. The gap between scientific findings and their interpretation by the general public needs to be filled. This would help to create a unified front against disease and increase the support (both general and financial) for researchers. Providing more funding that is geared towards early career researchers, or grants that encourage an early career researcher to team up with an established researcher to solidify their track record. How does the tenure system work in Australia? In Australia, tenure is awarded in an academic position after a probationary period, which is two years at the University of Wollongong. There are different positions on the scale: we have associate lecturer, lecturer, senior lecturer, associate professor, professor and senior professor. At our university (and it would be a similar process elsewhere I am sure), we are required to fulfil certain criteria in four domains: teaching, research, governance and community outreach. These goals are dependent on the level of your position, so the expected outcomes for a professor are set at a higher level than those for a lecturer. I am lucky to be a lecturer at this early stage in my career—I think I was just in the right place at the right time. I guess they saw the potential in me to do well in the future, as well as my skills fitting the particular requirements of this job. Baking, gardening and playing with my three dogs, Cookie, Harley and Sook. Yes, absolutely, I think that most academics struggle with this. If anyone has the answer/solution, please contact me! Still at the University of Wollongong, helping to train the new generation of medical practitioners to practice medicine using an evidence-based approach in our regional, rural and remote communities. Furthermore, I aim to still be contributing to the current body of scientific literature through my research to improve health and prevent disease. I actually enjoy teaching! It is one of my favourite parts of my job.